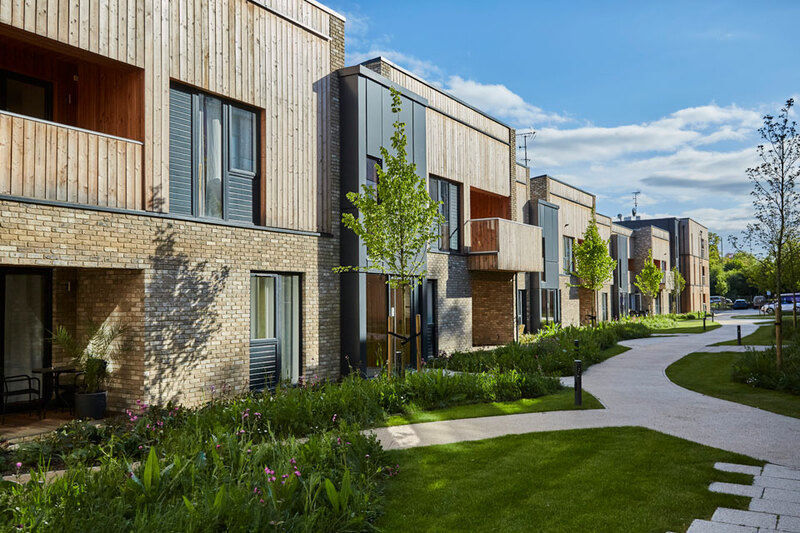 Bronze goes to Clock House Gardens, a derelict hotel site that has been transformed into a new residential “community” creating 50 new homes on a key gateway site into Welwyn Garden City. The design responds to the particular and specific site constraints, with the A1(M) on one side of the plot and dense woodland on the other. The proximity to the road heavily influenced the design concept, with the new access road and parking located to run parallel with the A1(M) thus allowing the developer to create a private, pedestrianised and landscaped courtyard screened and separated from the busy main road. It is described as being a modern take on a walled garden, with buildings formed to minimise effects from the road and maximise the benefits of the site’s geometry and the neighbouring woodland. The elevations and materials are contemporary and crisp with vertical and horizontal timber cladding echoing the wooded backdrop. The restrained use of brickwork, simply detailed with deep reveals and feature brick panels, complements the regular geometry of the fenestration, with just a few projecting windows and glass balustrading adding interest to the largely flat facades. This is an excellent piece of urban design.